UpLift™ (Facelift Alternative Milwaukee) is a recent and advanced procedure to address the aging face. Specifically, UpLift™ (Facelift Alternative Milwaukee) was designed as an alternative to a traditional facelift by addressing jowling, neck laxity (AKA the dreaded “turkey neck”), and wrinkles in a less invasive way. A traditional face or neck lift requires general anesthesia and, in some cases, hospitalization. UpLift™ (Facelift Alternative Milwaukee) is safer, more effective, and requires less downtime than a traditional facelift. In addition, results can much more natural appearing *. In recent years, a number of physicians have been offering various types of “mini-lifts” to address these concerns in a way that avoids major surgery. These are often done under “twilight” in a surgery center. IVs are still required to allow for deeper sedation. However, as some surgeons have noted, this “mini-lift” resulted in, at best, a “mini result”. The UpLift™ (Facelift Alternative Milwaukee) is the best of both worlds: it is less invasive and it can lead to excellent long-lasting results *. When searching for a cosmetic surgeon, it is always wise to seek out the physician who has performed the most number of cases in his or her particular field. Dr. Rosett is considered one of the foremost experts in the area of “aging face surgery” and has performed over 2000 such procedures. This sheer volume puts him in the top 1% of surgeons in the world in terms of surgical experience in this area. In addition, in recent years, he has also become an authority on laser technology and its use in both the face and body. The unique skill set possessed by Dr. Rosett has allowed him to design and utilize the most cutting edge technologies for the aging face available in modern cosmetic medicine. He coined the name “UpLift™” for this procedure after seeing first-hand the dramatic impact it was making in the quality of life and lifestyles of his patients. Men and women who had received an UpLift™ (Facelift Alternative Milwaukee) were reporting significant changes in their sense of well-being and vitality. In short, Dr. Rosett has discovered that the secret solution for droopy jowls, neck laxity (turkey neck), and wrinkles involves using a hybrid of technologies. Happily, harnessing these advancements technology not only represents a benefit, but requires the least amount of recovery time. While fatty tissue in the neck alone is best addressed with laser liposuction, the combination of jowls and neck problems is best addressed by a combination of minor surgical maneuvers. Each procedure is contoured to each patient’s specific needs. Since no two faces are the same, no single procedure is ever the same. UpLift™ (Facelift Alternative Milwaukee) is designed to reverse the aging process for you in the form of reducing jowls, reducing wrinkles, and removing sun-damaged skin. The overall result for UpLift™ (Facelift Alternative Milwaukee) patients is a defined jawline, smoother and tighter neck, and supple skin that lies naturally on the face just as it did years ago before gravity and the sun left their mark. Because UpLift™ (Facelift Alternative Milwaukee) utilizes laser technology and limited surgical procedures, procedures are done in the office without IVs or general anesthesia. Most procedures take about one hour to complete. Who is a candidate for UpLift™? If you look in the mirror and see jowling, wrinkling, or a turkey neck, you may very well be a candidate for UpLift™ (Facelift Alternative Milwaukee). There is no specific age minimum or limit to who can have the procedures. Much of this is determined by your own genetics and lifestyle. For example, people of Asian or African heritage frequently have collagen and elastin (the skeleton of the skin) that is highly resistant to aging and may not experience significant jowling, neck laxity, or wrinkles well into their sixth decade of life. Alternatively, people of English, Irish, Scottish and Scandinavian heritage are often on the other side of the spectrum. In these individuals, significant signs of aging may appear in the mid to late thirties. Many of these younger patients are quite reluctant to pursue this kind of procedure feeling that they are too young. However, those who do are typically quite happy to have the jaw line and neck that they had back in their 20s. Unlike other facelift alternatives, UpLift™ (Facelift Alternative Milwaukee) not only addresses the way a persons face looks today, but also addresses how your face will look a decade from now. Skin quality and firmness is restored, and the aging process is staved off in a way that looks natural. Laser technology is utilized not only to improve the look of your skin now, but also serves to strengthen the skeleton of your skin to make it more resistant to gravity. In other words, we try to make everyone’s skin as strong as Asian and African skin, nature’s most resistant skin-types to the ravages of sun and gravity. 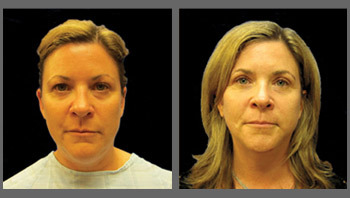 How is UpLift™ different from a facelift? The term facelift is used to describe many different types of procedures. The traditional deep plane facelift is usually what people think of when they hear about a “facelift”. This technique must be done in a surgery center or hospital and requires either general anesthesia or deep intravenous sedation that is delivered through your veins. The reason for this is the aggressive nature of the procedure. The operation usually involves some fairly risky maneuvers around the nerve that controls the face and can even involve dissecting down to the bone of the face. A deep plane facelift frequently will often be done in conjunction with a brow lift and, as a result, the incisions may go all the way across the forehead, in front of the ears and, behind the ears extending down almost to the back of your head. The recovery after a deep plane facelift may be several weeks. It may require hospitalization and, in some cases, may result in an overly pulled “wind swept” appearance. Furthermore, a deep plane facelift does not address the texture or strength of the skin. UpLift™, a facelift alternative, by contrast, uses minimal hair line incisions, is done in the office without IVs or general anesthesia, and has a much short recovery period. Perhaps the most notable difference in the result of an UpLift™ patient is an actual improvement in the texture and elasticity which result in a youthful glow of the skin. The surgical portion consists of a very common but effective technique known as a SMAS placation. The muscles in the neck that hang as we age are in continuity with fibrous layers in the face (the SMAS). By suspending the SMAS up, not only do the jowls go away, but the hanging neck does as well. In addition, to further tighten the neck, a laser fiber is gently tracked right underneath the skin layer to melt a small amount of fat and, at the same time, provide significant tightening of the skin. Six weeks after the procedure, the patient returns * to the office and sun damage is treated with the premiere resurfacing laser in the world, the Sciton erbium yag laser. Additional skin tightening is accomplished by broadband light technology in a procedure that has recently been featured on the “Doctors” television show called “Skin Tyte™”. 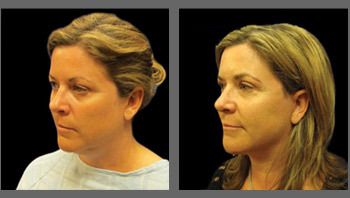 Certainly, not all faces require the same techniques or the same laser technologies, but having access to all of these tools gives us the opportunity to contour each procedure specifically to the patient’s needs, resulting in an optimal, natural appearing result *. We hate unnatural appearing, operated looking results and it is our first priority to make everyone look natural. Traditional deep plane facelifts require several weeks to recover. There is often severe swelling, bruising and more. UpLift™ (Facelift Alternative Milwaukee) minimizes this recovery. However, since it still requires some less aggressive surgical procedures, there is some down time. Typically, small sutures are placed at the hairline and pre-auricular incisions and these stay in on average of about 7-8 days. We recommend taking this amount of time off from work to recover. Everyone is different but the vast majority of people can go back to work without noticeable swelling at that time. Who is not a candidate for UpLift™? Anyone who is healthy and has the patterns of aging previously described is a candidate for UpLift™. Typically people of European descent will begin to see significant changes in their skin and face texture by age 40. Whether a patient has a small amount of loose skin around their neck and face, or a heavy neck with significant jowling and facial folds, Dr. Rosett can adjust the UpLift™ (Facelift Alternative Milwaukee) to achieve the best possible results for you *. Anyone considering any type of facelift or mini lift should seriously consider UpLift™. However, since this is an office procedure, we do require that patients be in relatively good health. In some cases, this will mean getting medical clearance from your physician. However, because general anesthesia is not used, the UpLift™ (Facelift Alternative Milwaukee) is considered a safer procedure. The youngest patient to undergo and UpLift™ procedure (Facelift Alternative Milwaukee) in our office was 37 years old. The oldest was 84. Age, in and of itself, is not a contraindication to the UpLift™ (Facelift Alternative Milwaukee) procedure. The best thing to do is to make an appointment for consultation with Dr. Rosett. Consultations are complimentary and often highly educational for patients interested in doing something about their appearance *. At no cost to you, there is no reason NOT to have a consultation.